In November 16, 1997, China freed its most prominant dissident, Wei Jingsheng, who had been imprisoned for most of the last 18 years for his involvement in the Chinese democracy movement. He is most prominent for having authored the essay, Fifth Modernization, which was posted on the “Democracy Wall” in Beijing in 1978. Due to the manifesto, Wei was arrested and convicted of “counterrevolutionary” activities. A nominee for the Nobel Peace Prize, Wei was put on a plane to the U.S. just 11 days after Chinese President Jiang Zemin was honored by the White House in state ceremonies. His release was long sought by Clinton, who’s policy of constructive engagement with China could be likened to acu-pressure: Healing results are delivered by applying specific pressure in a non-intrusive way. 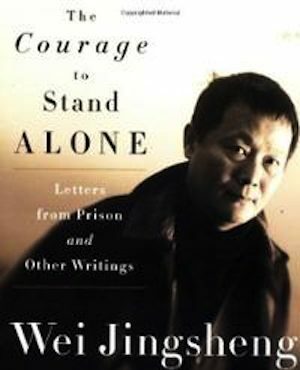 A book of Wei ‘s letters, “The Courage to Stand Alone: Letters from Prison and Other Writings ,” published this year by Viking Press reveals what the Washington Post calls an ability to retain his sense of purpose and humor “despite the poor conditions in jail, including long stretches of solitary confinement”.